The Melbourne International Flower and Garden Show is on in March every year at the gorgeous Royal Exhibition Building and Carlton Gardens in the middle of the city. This years highlights included the much anticipated "Food Forest" and beekeeping gardens, showing a shift away from the "high end" designed gardens and drought loving plants of past years and focusing on sustainability, food production, and achieveable gardening, bringing inspiration to melbourne home gardeners and designers alike. Layers of edible ground covers and herbs, vegetables and fruit trees was a sensory delight and to a vegetable gardener like me, it was heaven! In fact the idea behind the display for the show was to invite visitors in "feeling like Adam and Eve," tempting the senses with smells of rich lavender, basil, mints, thyme and even fragrant citrus fruit! 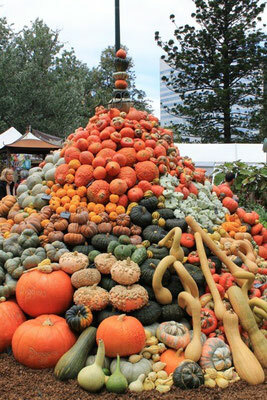 I visited nearing the end of the show and it astounded me that all the vegetables that had been set up a week ago still looked and smelled amazing, as if they had always been there. The use of space was amazing, every spot made very usable and productive. 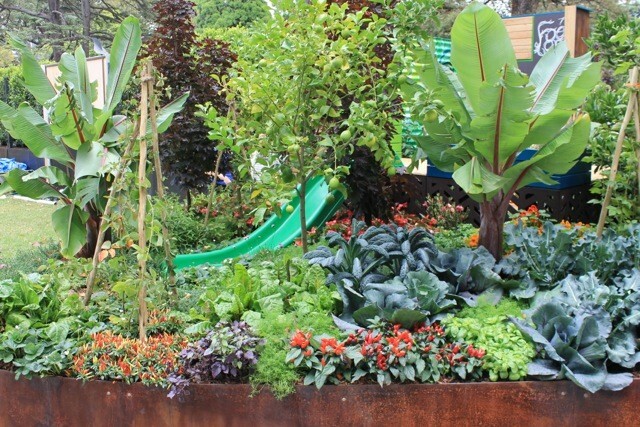 The centrepiece was a lovely green outdoor kitchen and vertical gardens, a picnic table to the right were the garden could be enjoyed and a chicken run to the left that included a childs slide, bringing lots of fun to the garden. 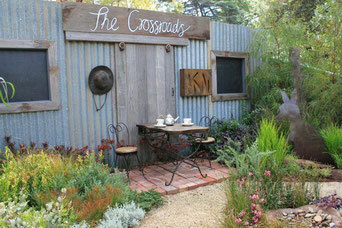 This garden would definitely keep people of all ages entertained!! As soon as the show kicked off this garden was creating so much interest. Its message is clear. The bee is the most important creature in the garden, without bees there would be no colour in our world. 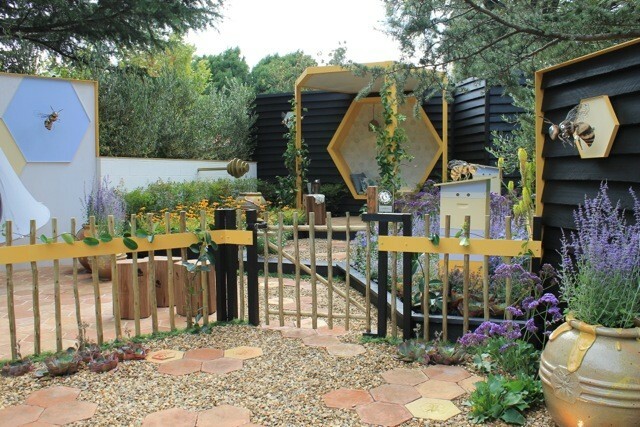 This garden used three striking colours to the max, purple, yellow and black. Yellow coneflowers and lavender, which are both fantastic bee attracting plants highlighted against the black backing and features in the garden. Yellow to the left and Purple to the right only. 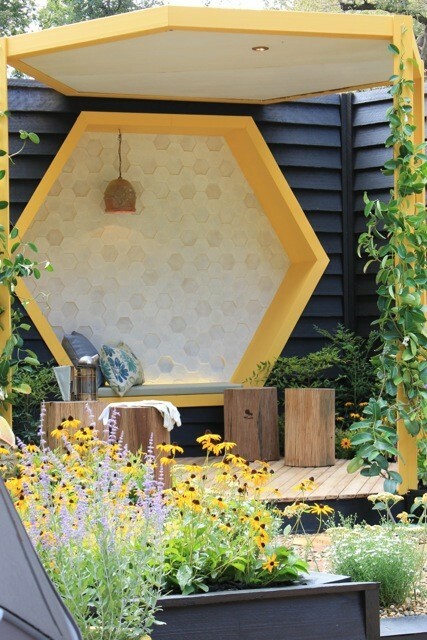 Honey pot features, sculpted bees and hexagon shaped tiles and seated areas were delightul. And there were lots of bees of course. I have been a member of the diggers club for a few years, their heritage seed saving efforts are amazing and this year they went all out for the garden show. They created a pumpkin hill with 1100 heritage pumpkins! Truly stunnng. Their other veggies were also on display as well as a little greenhouse and a Gypsy Cabin from Blackdown Shepard Huts. A highly inspring walkway with gardens created by local university students in a small space using affordable materials and planrtings. These competition gardeners show us what can be done with so little, and the results are amazing. 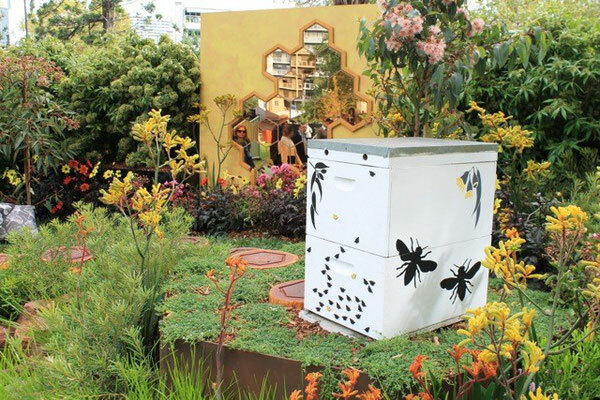 "Crossroads" was a favourite of mine and also "The Pollinator Partnership", another bee keeping garden, ideal for suburban and urban spaces.